Utrecht also made clear that the campaign will not accept a resolution in Michigan that awards Obama any delegates, because the Illinois senator took his name off the ballot there. To give Obama any votes from Michigan will be yet another slap in the face of Democrats. For him and his camp to even think they would be eligible for votes from Michigan is ludicris. But then I dont think he is as intelligent as people try to make him. For him to claim that he deserves to have the uncommited votes from Michigan is like stealing and incredibly dishonest. I say again, the voters of this country had no say in the decision to move the election date back and for the people of Michigan and Florida to be punished in this way is dispicable. And Florida and Michigan werent the only states whose dates were moved back but you dont hear anythng about those states being punished and thier delegates not being seated. All I can think is that we have a huge job ahead of us to fix this broken system. We are not sheep who are being led to the slaughter, we have a voice and we need to band together and make it heard loud and clear that we are not going totake this kind of treatment anymore. Six states held their primaries before February 5 and yet only 2, the 2 which Hillary won, are being penalized. Does the DNC have an agenda? Did anyone see or can anyone tell me where I can get a transcript of an interview which aired May 30 on MSNBC between Charlie Cook and Andrea Mitchell where Charlie Cook said something to the effect that the DNC can't take the nomination away from the African-Americans because they will be upset; the women will be upset too, but in 2, 4, 6 weeks they will get over it and then they will fall in line. @Candee B. - You forget that Clinton and Obama pledged not to campaign in Michigan and pledged to remove their names from the ballots in response to Michigan's primaries being held early. Obama and the other candidates removed their names from the ballot. Clinton should have removed her name too. Since Clinton is demanding that her votes in Michigan should be counted, why shouldn't the uncommitted votes count for Obama? They were uncommitted because they were not able to vote for anyone except Clinton (and Dodd) and they didn't want to vote for Clinton. An analogy: This would be like you and I winning a million dollars each from some sweepstakes. You and I make an agreement that animals would be better off with that money than we would be, and we both agree and donate our winnings to the ASPCA. You donate your money and I change my mind at the last minute and decided I want to keep the money after all. Wouldn't that piss you off a little bit? Wouldn't you say that was unfair? That is essentially what happened here. Obama and the other candidates took their names off the ballots in MI. Clinton was the only one who did not take her name off the ballot, as everyone had agreed. Michigan and Florida officials knew what they were doing was in violation of Party rules. They were warned. They defied. It is their fault innocent voters were caught up in their defiance. If they are allowed to escape any punishment, what about the 2012 campaign? Will even greater chaos prevail? If rules are not enforced, what is the purpose of having rules? Russ..and Susan..you both are missing OUR point. POLITICAL PARTY RULES MEAN NOTHING to the Democrats that are strongly united as "we the people" and strongly believe in OUR rights to representation by voice or vote. I have family in combat. They DO NOT want OBAMA as their Commander-In-Chief. I will NOT vote for a dishonest and most inexperienced candidate for this position. That is insane, for our troops, and for this country. Our troops don't want to hear how inspired the nation is...., Lord have mercy..., they want to know we have given them the best Commander-In-Chief that ran for the position. AND THEY SURE DON'T CARE ABOUT ANY PARTY RULES, AS THE DEATH COUNT IS OVER 4000. Hillary decided to leave her name on the ballot back in November of 2007, Obama decided to take his name off the ballot, WHICH HE DIDN'T HAVE TOO, not long before the Michigan primary. Once you dig and find out the real facts, the picture gets clearer. 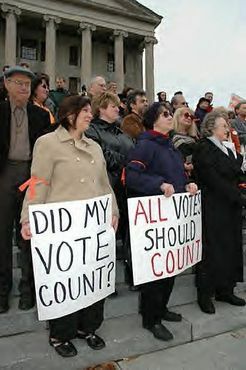 As far as the vote of a free country, NO ONE should be able to rule when to count a vote! A vote is a vote is a vote. One American = one vote. It's time to legislate some real CHANGE in thsi country if 2.3 million people's votes don't count because some DNC group thinks they can DICTATE when a state is allowed to set up a vote. Who cares? If it's run in legal fashion to that state, it should be counted as such by America. America is NOT the Democratic party...it's not the Republican party.....it's not the Independent party....it's a land of individuals who WANT THEIR VOICES HEARD! Hillary Clinton didn't go into the voting booths of 2.3 million American Democrats and pull the levor for these Americans, but I'm betting there's a whole lot of angry American's tonight because their votes were turned into a laugh today by their Party. Does the Democratic Party actually think what they did today ....going against the wishes of millions of Americans will be forgotten or forgiven no matter WHO this race is about? Why would you EVER trust this party again? One day - you're an American citizen hoping your vote counts, the next day, you're just someone to split in half and tossed to whomever they felt like throwing your vote to! No one will ever be able to justify what happened today....and there are 2.3 million people who are sitting around very ticked off about what Dean & his elitist crew did today. The Committee awarded to Senator Obama not only the delegates won by Uncommitted, but four of the delegates won by Senator Clinton. This decision violates the bedrock principles of our democracy and our Demcratic Party.